The Honolulu Diamond Sangha (HDS), a lay Zen Buddhist organization, was founded in 1959 by Anne Hopkins Aitken and Robert Aitken, Roshi, dharma heir of Yamada Roshi and author of Taking the Path of Zen, The Gateless Barrier: The Wu Men Kuan, and seven other Zen books. In the early years of the Honolulu Diamond Sangha, Zen masters Nakagawa Soen, Yasutani Hakuun, and Yamada Koun served as dharma teachers. 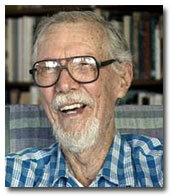 In 1974, Yamada Roshi recognized Robert Aitken as a Zen teacher. Aitken Roshi retired in 1996 and now lives on the Big Island of Hawai'i. Biography: A lifetime resident of Hawai'i, Aitken Roshi is a graduate of the University of Hawai'i with a BA degree in English literature and an MA degree in Japanese studies. In 1941, he was captured on Guam by invading Japanese forces, and interned in Japan for the duration of World War II. In the camp, he met the British scholar R.H. Blyth , who introduced him to Zen Buddhism. After the war, he practiced Zen with Senzaki Nyogen Sensei in Los Angeles, and traveled frequently to Japan to practice in monasteries and lay centers with Nakagawa Soen Roshi, Yasutani Haku'un Roshi , and Yamada Koun Roshi. In 1974, he was given approval to teach by the Yamada Roshi, Abbot of the Sanbo Kyodan in Kamakura, Japan, who gave him transmission as an independent master in 1985. Aitken Roshi is co-founder of the Buddhist Peace Fellowship (now with a local East Hawai‘i Chapter) and serves on its international board of advisors. He has been active in a number of peace, social justice, and ecological movements, and his writing reflects his concern that Buddhists be engaged in social applications of their experience. Aitken Roshi has given full transmission as independent masters to Nelson Foster, Honolulu Diamond Sangha and Ring of Bone Zendo in Nevada City, California; John Tarrant , Pacific Zen Institute in Santa Rosa, California; Patrick Hawk, Zen Desert Sangha in Tucson, Arizona, and Mountain Cloud Zen Center in Santa Fe, New Mexico; Joseph Bobrow , Harbor Sangha in San Francisco, California; Jack Duffy , Three Treasures Sangha in Seattle, Washington; Augusto Alcalde, Vimalakirti Sangha, in Cordoba, Argentina and RolfDrosten, Wolken-und-Mond-Sangha (Clouds and Moon Sangha) , in Leverkusen, Germany. He authorized Pia Gyger, One Ground Zendo in Luzern, Switzerland, as an affiliate teacher of the Diamond Sangha. He joined with John Tarrant in giving transmission as independent masters to Subhana Barzaghi in Sydney, New South Wales, Australia; and to Ross Bolleter in Perth, Western Australia. As a retired master, Aitken Roshi works with a few long-time students, and continues to study and write. His work, Zen Master Raven: Sayings and Doings of a Wise Bird , was published by Tuttle in 2002 [review]. His most recent publications, The Morning Star: New and Collected Zen Writings , and a new edition of A Zen Wave: Basho's Haiku and Zen , were released in October, 2003, by Shoemaker and Hoard.